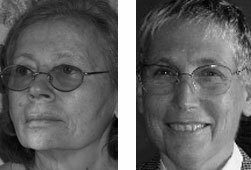 Irena Klepfisz and Nancy Stoller, close friends for over two decades, have been working in prisons for many years—Irena as a teacher and Nancy as an activist and researcher. Here they discuss this work and their concerns about prison life. Irena, a poet and a writer, currently teaches courses on Jewish women at Barnard College and goes weekly to Bedford Hills Correctional Facility for Women in upstate New York. Nancy, who has written several books on organizing, has recently retired as a professor of community studies at U.C.Santa Cruz. This conversation was moderated by Sandra Butler, Persimmon Tree contributing editor. PT: Nancy, you’ve been doing prison work for a long time. How has your thinking about prisons changed over the years? NS: It’s most evident in my writing. Recently I’ve gotten into more philosophical and ethical concerns about prison. PT: Can you give us some background on this? NS: My work in prisons began 35 years ago, in the mid-’70s. I was invited to go to the women’s prison in California—at that time, there was only one—to teach a workshop for the prisoners about women’s health. After a while, the women asked me what would be a really good healthcare system for them to have in prison. I blithely thought I would go to the library and look it up. But I found that there was no research on prison healthcare available. That led to my long-term, up-and-down career of studying women’s health in prison. A lot of what I did was to document, for example, the ways in which women prisoners got different care than men, or the difficulties for prisoners who were mothers. PT: I’d like to know more about that. NS: The smaller number of women in jails and prisons results in fewer facilities, fewer services, and greater distances from home. In addition, women are stereotyped as complaining more about their bodies and consequently get less adequate treatment. Often the doctors are poorly educated about the women’s health needs. Over seventy percent of the women sentenced to prison have children under 18. Long sentences can separate them for years. But even a short sentence can result in a woman losing her child to foster care and then adoption for the crimes of “neglect” and “abandonment” —just because she is in jail. PT: What happened with all the research you did? NS: Much of it was used to try to change state, local, and federal policy about how women prisoners are treated. Sometimes we succeeded. But then, over time I became involved with a lot of people who were prison abolitionists. One side of me was opposed to anybody going to jail, and the other side was trying to make things better. I lived with that contradiction in my work.Currently I find myself writing more about that contradiction and less about how to improve care. I write about the impossibility of actually creating a physically or emotionally healthy life in a prison. No matter how much patching up is done by doctors or counselors or friends or even organic food, Zen, and yoga, a prisoner’s life is destroyed every day by involuntary confinement and intentional degradation. Sometimes we say to people, “You can be in prison and you can be free.” But the truth is that you can’t be in prison and not suffer. For me, this second point is more important in my writing now. IK: Nancy and I have been doing very, very different things. Her involvement has been decades long, while I started 9 years ago. PT: Why did you begin? IK: I’d been wanting to get involved for some time but hadn’t done anything about it. I met somebody who was teaching regularly at Bedford prison, and she told me how to apply. At the time, they had a Masters’ program and that’s where they wanted me to work, teaching writing, literature, and women’s studies. That program ended, and now I teach in the college. NS: You were at a period when you were very discouraged with the Israeli-Palestinian political situation. IK: I had worked on Middle East peace for years and was burned out. Also, my family obligations were taking up a lot more of my energy. NS: As I remember, you were open to doing something different that would be useful but wouldn’t require too much leadership. You wanted something that would let you have more control of your time. You also wanted to work with women whose class, race, and cultural life would be different from those of your college students. Over the first year or two, when we talked about it, you said how much you were getting out of it. IK: I was very interested in my teaching there, but initially I was also very scared. I didn’t really know what I was getting into. I didn’t know who these women were. It was very, very challenging. IK: The circumstances under which these women learn and study are very difficult. They have prison jobs during the day—classes are from 6:30 to 9:00 p.m.—and they have limited library and computer access. There’s no internet, and they can’t make notes in their texts because these are collected at the end of the semester and reused. Plus some of the women have had a lifetime of failure in school settings, and this causes problems. They have little confidence in their skills and often almost no confidence in their intellectual abilities. Also, the cultural framework of college raises questions for them. Like, why are you going to college or why are you studying? What is it for? Why is it good to write a complete sentence? Why is it important to study history? Literature?These things are taken for granted in a place like Barnard. For the women in prison, it’s not clear what critical thinking is, or what research is about. What are footnotes for and how are they useful? There’s this whole academic form and way of speaking and talking that they’re totally apart from. It’s very challenging to try to help them bridge that gap. But one of the wonderful things I am able to witness is these women’s discovery of their own critical skill, their own creativity. Many students who began studying for the GED have moved on to the AA and then the BS programs. Some of them have handed me manuscripts that they’ve written—stories, autobiography, poetry. It’s amazing to watch this self-discovery. PT: I imagine your students at Bedford have some very interesting perspectives on the literature they read. IK: They do. At Bedford I can teach any authors I want, compared to teaching only Jewish women authors at Barnard. So I teach third-world women authors, I teach men. I teach a story like “Bartleby the Scrivener” by Herman Melville about a man who stands up to his boss. The boss says, “Bartleby, I want you to copy this,” and he says, “I’d prefer not to.” He says that for the rest of the story, and then he dies. My Bedford students have such a different take on this story. In a way, these women have said “I’d prefer not to”—which is the reason they’re incarcerated. To them, Bartleby is very real and less of a metaphor than how I read it. At the same time, anyone on the outside of prison always has some area of choice, some ability to say “I’d prefer not to.” But in prison you don’t have that choice, ever, without serious consequences. So to the women, it’s more of a fairy tale than I have, till now, read it as.I’ve also taught Mary Shelley’s Frankenstein and Kafka’s Metamorphosisand listened to the way the women responded to the monster and the freakish bug—and realized again that for them it’s not a metaphor. They’re viewing themselves as they think others see them. I came to understand the T.S. Eliot line, “I have measured out my life in coffee spoons,” in a very different way when a woman serving a 25-to-life sentence talked about how the line expressed her own feelings about being incarcerated. From a very selfish point of view, I feel like the women in Bedford have given me an enormous amount to think about and forced me to reconsider my assumptions about literature. PT: Let’s go back to you, Nancy, and what you said about your thinking deepening about prison after 35 years. NS: I’m involved in the same materials, but I’m affected differently by them. I don’t have the same protections, perhaps, that I had before. Previously my involvement in research pushed me to write in an “objective” tone. I wanted to convince people that what I saw was really true. But that tone also protected me emotionally. Now I’m more vulnerable to my own knowledge, and I want to put those feelings on paper. I really don’t care any more what people think about my writing. I write what I want to say. IK: You’re braver than I am. I don’t feel very brave these days. Twenty years ago I was much more daring. Aging has made me feel more vulnerable. For example, I’m an adjunct instructor at Barnard, and I don’t think I’m going to be dumped—but at the same time, I feel vulnerable when students evaluate me. I have sudden fears, like the time you and I were in Mexico together and I became frightened by the waves. Where does this fear come from? Is it age? About ten years ago I fell down the staircase and really smashed my face. Now, every time I look down a staircase, I think about it. I live two floors up, so I’m always looking down a steep staircase. NS: For me, both because I’ve retired and put an end to one period of my life, and because my mother died three years ago, I have much more of a sense of being at a different stage. This stage is only going to last a while, so it’s very important for me to accomplish certain things during this time. I feel like I’m back to where I was in the ’60s, that feeling of, well, I’ll do my best, and the only bad thing that can happen to me is that I’ll die. But then there’s this other side—what do I want to get done before I die? PT: You both are committed to continuing your work with women in prison. What draws you to these women? IK: I’m crazy about my students. I love going in and seeing everybody at the Learning Center. I was very gratified a few weeks ago when some of my students from my Introduction to Fiction class last semester were there at the computers, working on philosophy papers, using some of the stories that we had read. NS: I admire most of these women when I hear their life stories. I see them as survivors and as very, very creative in their survival techniques. They teach me what women can do, even in the very difficult circumstances that they’re in. For example, I’ve seen women with advanced cancer, AIDS, or on dialysis become in-prison educators, file lawsuits, and testify publicly about conditions in their prisons, despite threats and retaliation. PT: Have you seen the conditions inside the prisons change over time? NS: People’s ability to understand their situation and work positively with each other has grown. I’ve been involved in several projects where there’s a back and forth between a community group that’s working with women inside prison on a particular concern—health, for example. Once we identify the problem with them and more research is done, we can pressure policymakers to change legislation.Over the years I’ve seen the development of women, particularly in California, who have been in and out of prisons and who’ve become public speakers and activists. We’ve devised ways to help those who are still inside be able to address people outside. But the prison conditions for women—and men, although I tend to work more with women—have gotten worse. In the ’70s, prisoners were often housed two to a cell, but now a two-person cell may hold four or six. More and more long-term prisoners find themselves in dorms of 15, 20, or even 50, with no private space.I’m friends with a woman in prison who’s serving a life sentence. I met her back in 1973, and I’ve been visiting her ever since. That has given me a personal way of seeing the changes from the inside in this particular prison. When we met, this woman could receive clothing and food packages from home. Now she can only get approved items from specialized companies. She used to have family photos, a variety of books, and wall decorations, but now photos and books are limited to ten. All of her possessions have to fit in one foot locker. When we met, she could wear makeup, color her hair, and wear her own clothes to the visiting room; now that’s gone and for the past ten years she has worn the same drab blue jeans and t-shirt, day in and day out. Visiting her has deepened my sorrow at what happens inside prison. Here’s a woman who I know doesn’t belong in there, just like many other women. I admire her ability to survive and to do a lot of really excellent things inside, but I imagine that she’ll be there the rest of her life. It’s so painful to think about. IK: One of the saddest things I’ve seen is the double-edged sword of the triumphs in Bedford. When people get their degrees or they complete courses, there’s an enormous joy about it and they have a wonderful graduation at Bedford to which families are invited. The graduates bring their relatives up with them to get their diplomas. It’s a great, wonderful moment—but at the same time it’s a real heartbreaker. You think about what could be, the possibilities, the potential, and as much as you’re feeling good about the triumph, you know the reality of their situation. The fact that the women are willing to take these courses—it’s just amazing to me. They have different motives and different ways of dealing, and some of them have difficulties adjusting, but it’s really awesome. The students at Barnard always say about everything, “It’s awesome,” but I mean it in a real sense of awe—that these women plug away at these things. It’s so difficult there, and yet they just insist on doing it. PT: I appreciate how important your work in prisons has been for both of you. NS: If you tell me I can’t go somewhere, that’s where I want to go. The idea that there are these huge institutions all over the country that we’re all locked out of—that makes me want to know what’s going on in there. I want to tell people on the outside that these places are not just big, empty spaces that take up acres and acres of land. There are real people in there! I have a lot of anger and energy that makes me want to work with them to make their lives better. Irena Klepfisz is a poet, translator, and scholar of Eastern European Yiddish women writers and activists. She teaches courses on Jewish women’s history, literature, and culture in the Women’s Studies Department at Barnard College. For the past 9 years she has been teaching literature, writing, and women’s studies in the college program at Bedford Hills Correctional Facility. This coming fall she is offering a workshop on Yiddish translation at the YIVO Institute for Jewish Research at the Center for Jewish History. Nancy Stoller began her career as an activist-scholar in 1960 when she picketed the Woolworth’s down the street from her college and then joined the Student Non-violent Coordinating Committee. She enjoys being both a participant and community-based researcher in progressive social change movements. As an academic, she has written extensively on the health care access challenges facing women, prisoners, lesbians, prostitutes, and people with HIV. After teaching at the University of California, Santa Cruz, for 31 years, Nancy is now writing a memoir about her experiences studying prison environments. View More: Next piece "Penetrating Surfaces: An Introduction to Alicia Ostriker’s Poetry", Home, Archive.